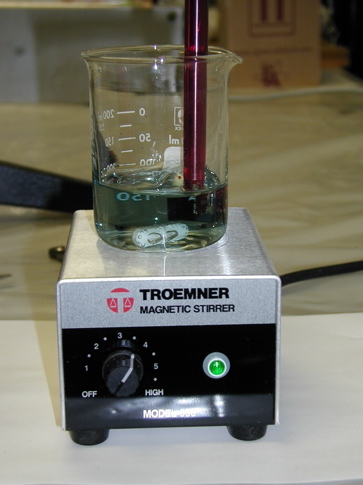 This semester the course considered the BZ reaction in a closed reactor (glass beaker) with continuous stirring (spatially homogeneous reaction). 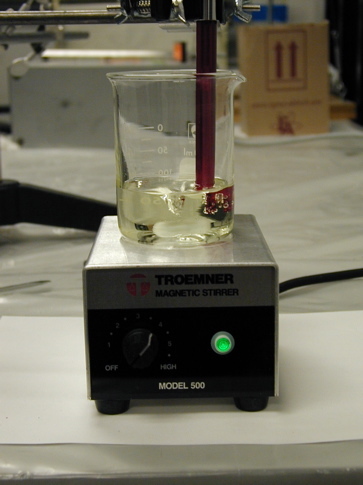 We performed the experiment and modeled it with a system of ordinary differential equations. First, the students learned how to use the Law of Mass Action to derive ordinary differential equation models of chemical reactions. Then, nonlinear-dynamics theoretical tools for the analysis of the resulting finite-dimensional dynamical system of ordinary differential equations were employed to analytically study the resulting models. 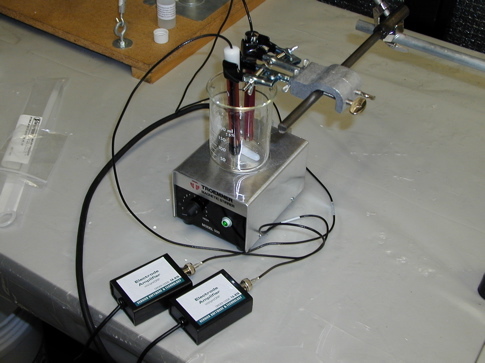 Also, the students employed potentiometric methods to directly measure the concentrations of the important components in this reaction using special electrodes and the LabPro equipment; the experimental results were compared to the theoretical model result. 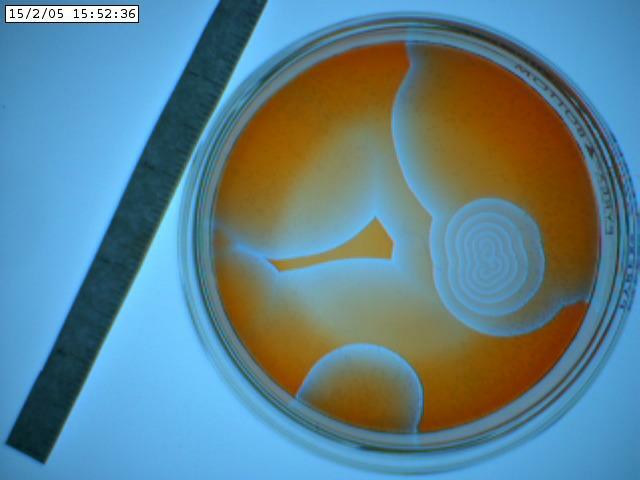 Also, the BZ reaction in Petri dishes (spatially inhomogeneous reaction) was considered. 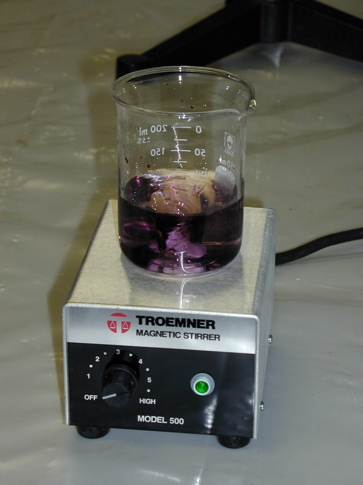 The students performed the experiment and modeled it with a system of parabolic partial differential equations. 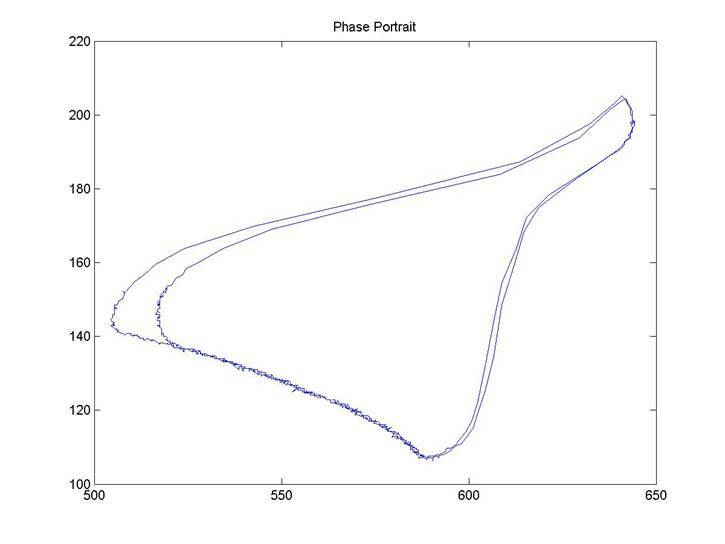 Some theoretical tools for the analysis of the resulting infinite-dimensional dynamical system comprised of reaction-diffusion partial differential equations were presented, and some numerical tools to solve such models of the experiment were employed. 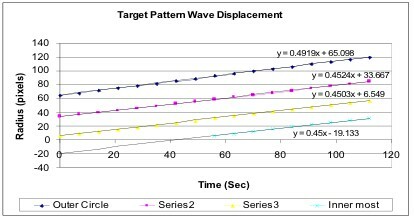 Also, a video camera was used to record the evolution of target patterns and spiral waves in an attempt to compare the observed chemical wave speed with that obtained through theory and computational experiments. It turned out that the iSight camera was picking up a 60 Hz variation in the illumination amplitude. So after some initial runs of the experiment, and the taking of some images (see below), this camera was abandoned in favor of a digital camera (e.g., Canon A85) which could be controlled from software installed on a PC (in the case of the A85 the software in question is RemoteCapture accessible from ImageBrowser). See below for more info on the settings used and other issues that arose in this case. Here's a gif animation of 55 captures spaced 30 seconds apart (5 frames per capture are averaged). 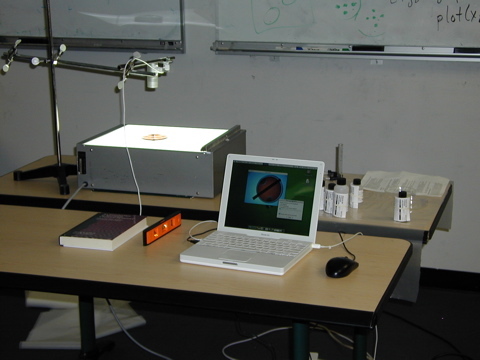 The image capture was done with the iSight camera and the Petri dish was placed on a white sheet of paper. 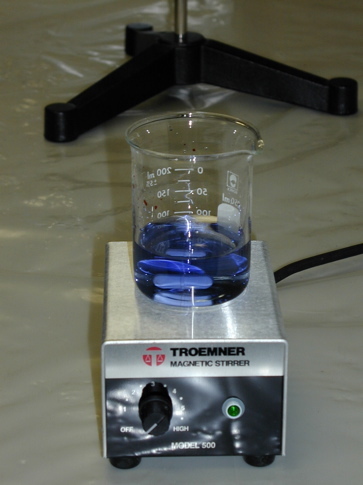 Lightning was provided from the room's overhead fluorescent lights (this was our first ever try of this experiment). Following we see two images captured with the iSight camera. The Petri dish was on the lightbox and what's shown below are the best images of a sequence of a few hundred. The variation of the background illumination due to the 60 Hz effect described above was very deleterious. The iSight setup was abandonded after this run. One can discern spiral waves in these images. Obviously, the fronts move with constant speed. 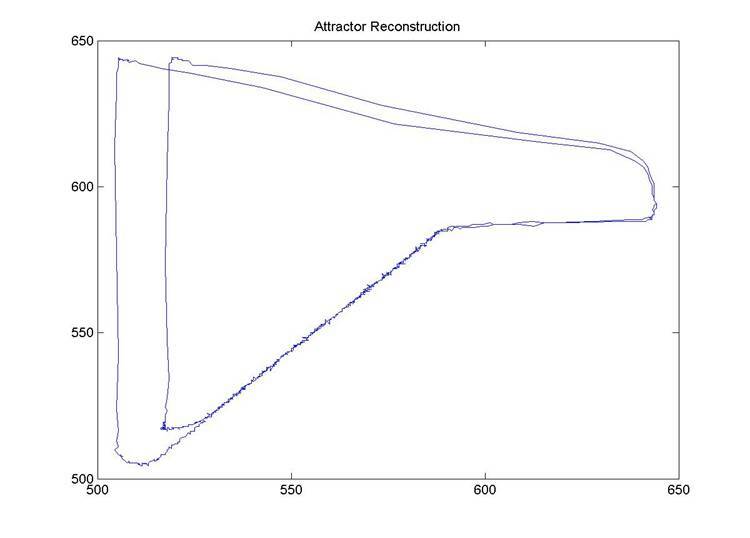 In both graphs above, a low value for the integrated intensity corresponds to the red state of the solution (reduced) while the peaks correspond to the blue state of the solution (oxidized, see 2D images further up). 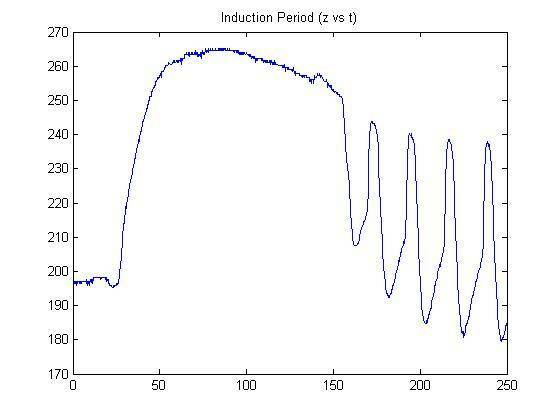 In all our experiments, the mixed solution almost always undergoes 1.5 bulk oscillations prior to being poured into the dish (red-->blue-->red). Once in the dish, the swirling/jostling involved in centering the dish under the camera produces another 1.5 bulk oscillations (red-->blue-->red). B) Temporal Oscillations in the Well-stirred Belousov-Zhabotinsky reaction: Here are some images of the setup and of the oscillations observed thus far. In the bottom row images the time from blue to blue is about 25 seconds. 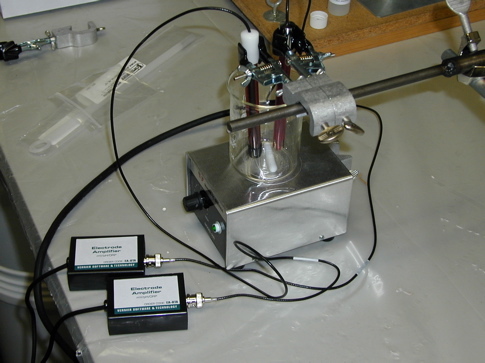 NOTE: The Weiss Bromide-sensitive and Platinum electrodes are connected to the Vernier LabPro interface (not shown in these shots) through Vernier Electrode Amplifiers. 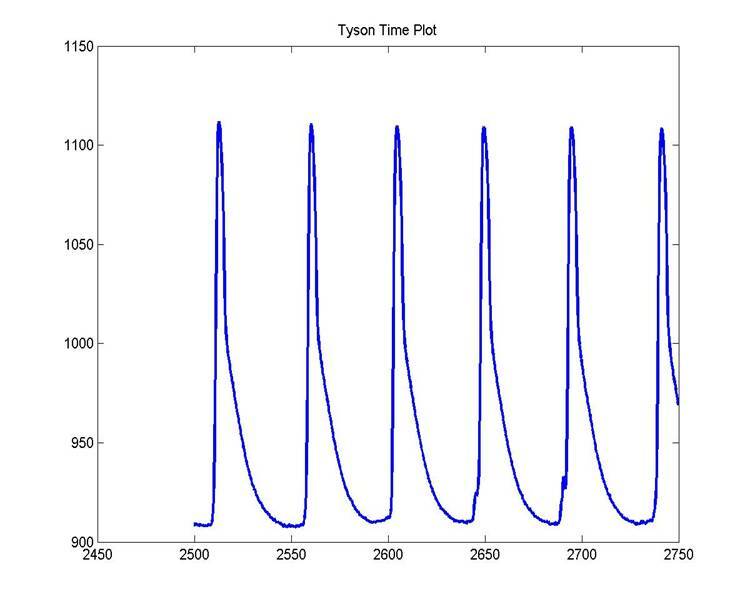 The Figure above shows long-time measurements of the concentrations in the Tyson recipe. 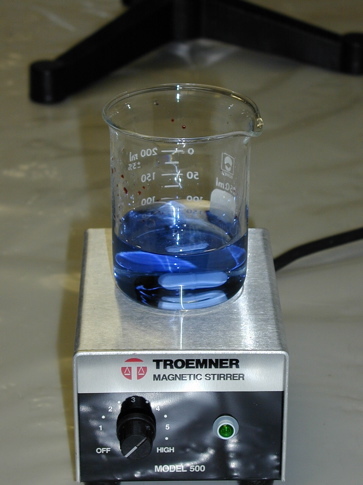 As the reaction drifts in phase space the measurements indicate the presence of intermittency. Using the Mathematica package Reaction-Diffusion lab the students attempted to simulate the BZ pattern formation experiment. The Figure below shows simulation results obtained by solving the Tyson-Fife 2D reduction of the Oregonator with no-flux boundary conditions on a square domain. 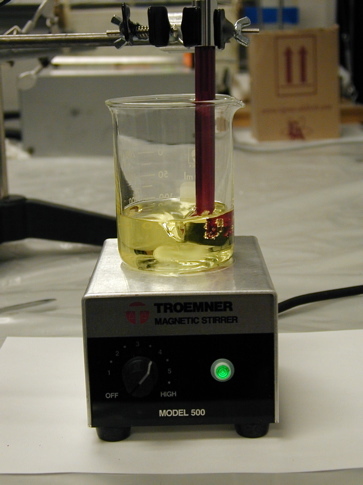 The picture on the left shows a fast-rising oxidation front, propagating in a reduced medium (black), which relaxes back to a state that is not as reduced as ahead of the front. The experimental image below resembles the above-left simulated image. 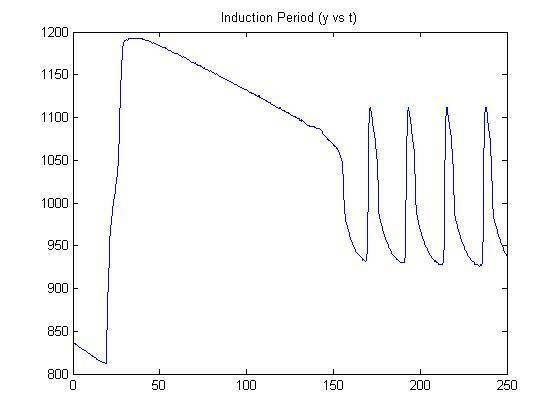 The following image shows an experimental determination of the wave speed of the first four circular waves emitted from a pacemaker center. The initial front is faster than subsequent fronts in accordance with the theory presented by Tyson and Fife. 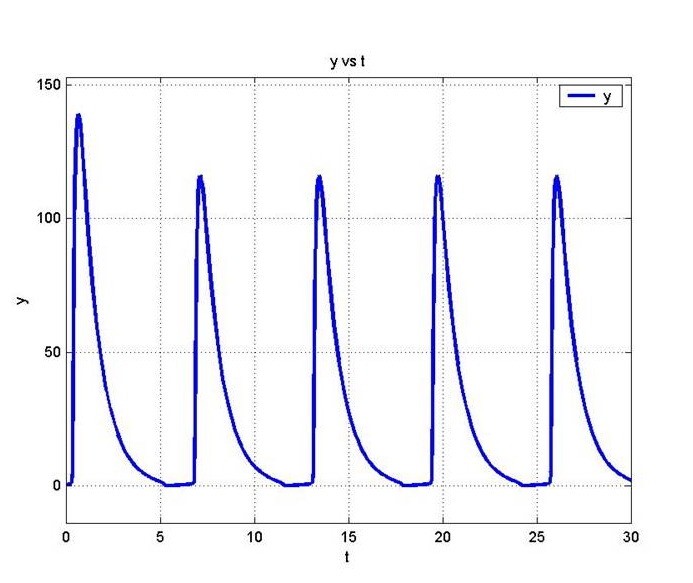 The slope of the lines represents the wavespeed in units of mm/sec. 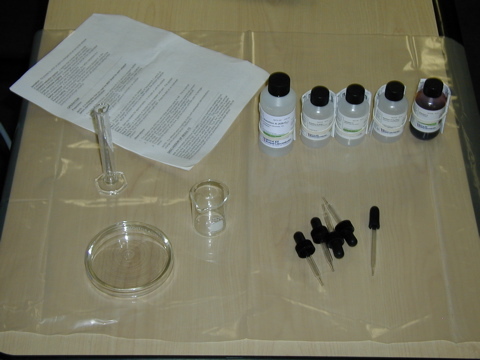 The Figures below show the computed (left) and the measured (right) Bromide concentration for Tyson's recipe. 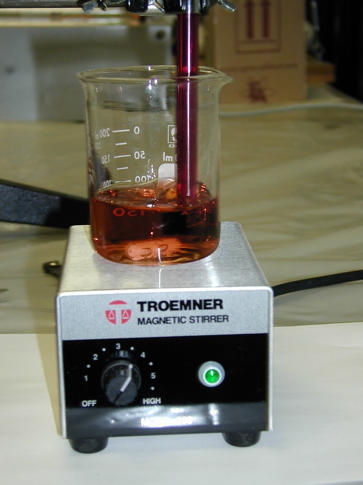 The Figures below show the measured induction periods for Bromide (left) and Cerium (right) in Tyson's recipe. 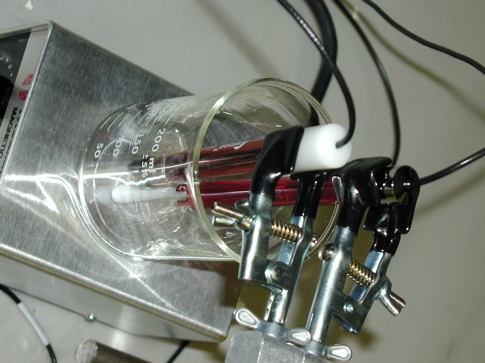 Below, the Figure on the left shows the measured limit cycle between Bromide and Cerium while the Figure on the right shows a reconstruction using only the measured Cerium potential.